Harmony Murphy Gallery is pleased to present an exhibition of new work by Erica Mahinay and Kathryn O’Halloran. The exhibition opens May 20th with a public reception on Saturday, May 23 from 6-9 PM and continues through June 27. For both artists, Saline Communion reflects their relationship as friends, collaborators, and confidants. The work is sourced from the deep well that is their relationship, which is made up of intimate conversations - drunk and sober, dancing, grooming, and of course from time to time working side by side. The ideas in the work reflect an ongoing dialogue between the artists - a dialogue that values freedom and generosity. Each of their independent practices benefits from this reciprocity. Mahinay and O’Halloran reject idea of the artist as “lone genius” and embrace open exchange, investigating as a team of explorers. Saline Communion conjures a range of images, including tears, sweat, salt-water pools, Epsom baths, soil treatments, and the ocean. The title suggests the possibility for intimate exchanges on a micro and macro level; moments of revelation that can occur both in the sweat on the brow, or bathing in the ocean. These moments are personal and social and have connotations of healing and self-care. 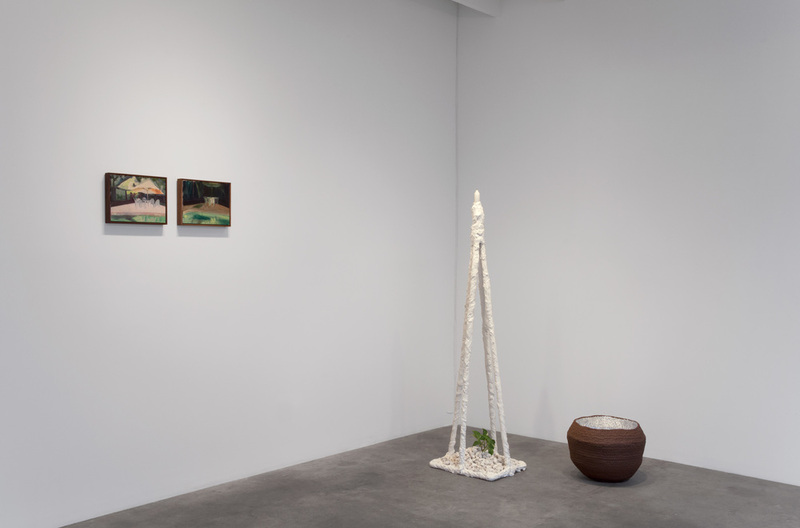 Erica Mahinay’s practice is rooted in the symbiotic and reciprocal relationship she has developed between working from observation and finding form through material investigation. Both approaches embrace a process of searching and the element of surprise. Each in its own way lends a sense of place, atmosphere, tone, emotion and physicality – a sum that is other than its parts. 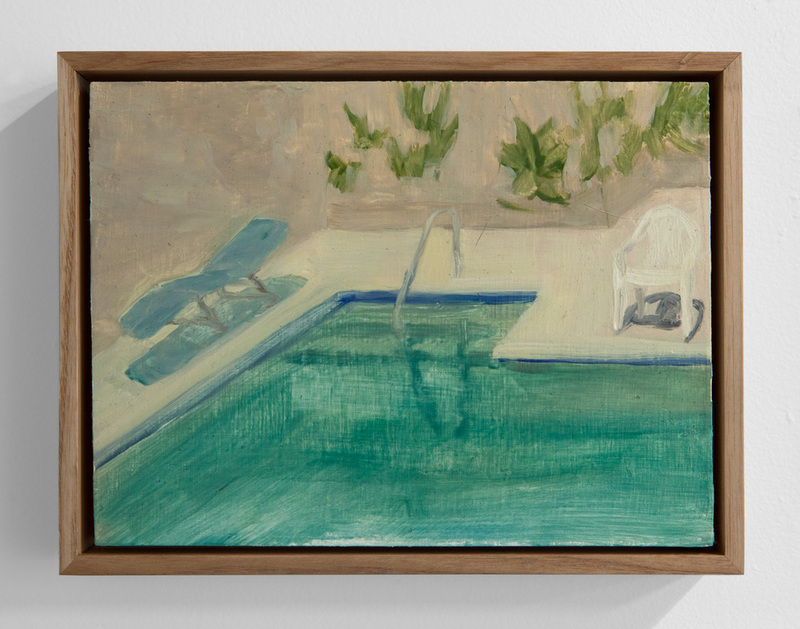 In a series of small oil paintings, Mahinay meditates on the calm reflective surface of a Los Feliz apartment pool over the course of twenty-four hours. This is a self-effacing undertaking, eschewing a feat of endurance to reflect on the communion that occurs between seeing and translating. In her Thin Skin series, reassembled and reconstituted surfaces embrace an uncertain ontological status and manifest a current condition in which composing and redefining the self becomes center. Here, she employs surface as a boundary. Translucent fields of color with stitched divides, painted portions, and an occasional wrinkle or pucker, highlight the thinness of surface and tenuousness of illusion. The historical trajectory of cut or collaged surfaces in abstract painting is integrated into the approach and traces the fine line between self- care and self- obsession. Both series employ reflection, transparency, and repetition to underscore a process of reexamination. In this way, Mahinay makes work that offers present moment and tactile experiences as space for reckoning with imperfection, vulnerability, mortality, and failure. For this series of sculptures O’Halloran makes spaces where personal crisis, surrender, solitude, isolation, and the desire for community intersect. Her work responds to subtle, systemic sociopolitical oppression. As recourse and resistance, she creates moments of exigency, of acceptance and hope that she describes as “shared spaces of the mind and heart...opportunities for self care.” O’Halloran finds correspondence in Audre Lorde’s statement, “Caring for myself is not self -indulgence, it is self- preservation, and that is an act of political warfare.” Her work takes cues from the spa, the dance club, the barber, and her experience on sports teams; places where she is calm, contained and self--reflexive while also participating in a larger, supportive group. Combining at-hand and easily available materials with the handmade, O’Halloran sites tender moments in the American, the everyday and the intimate. She uses older objects that have gathered experiences over time and place, in acknowledgement of the complicated histories that make up our identities. 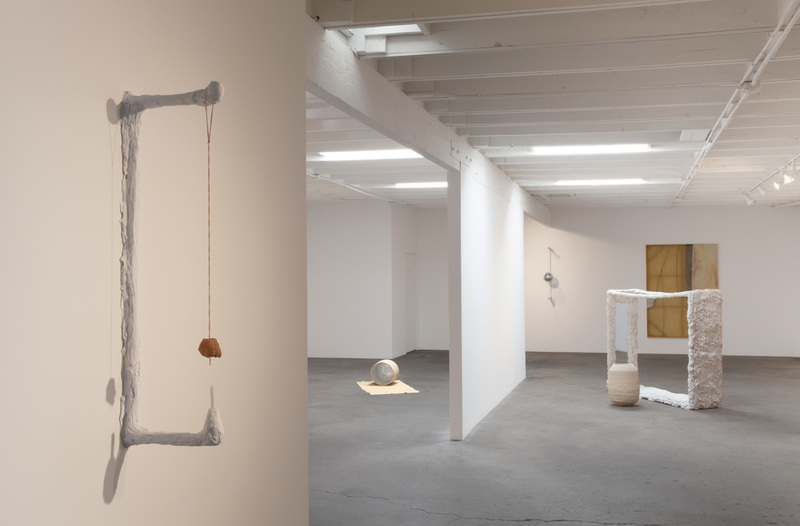 Her most recent work loosely falls into two main categories of objects: instruments used to send or receive signals, and objects for looking inward and being alone. Through the spaces she creates, she aims to preserve peaceful solitude in the face of the hard realities of our failing economy, and community in the face of systematic dispossession of families, women, and the American middle class. Erica Mahinay, (b. 1986, Santa Fe, New Mexico) holds a B.F.A. from Kansas City Art Institute (2008) and an M.F.A. from Cranbrook Academy of Art (2013). She has had solo exhibitions at Loudhailer Gallery, Los Angeles, T293, Naples, Italy, and Fused Space, San Francisco. She currently lives and works in Los Angeles. 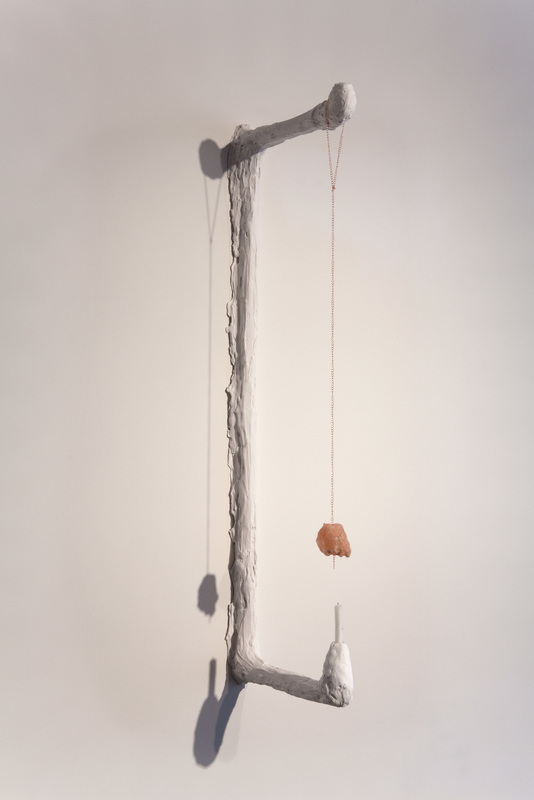 Kathryn O'Halloran, (b.1984, Oak Park, IL) holds a BA in sculpture from Hampshire College in Amherst, Massachusetts (2006) and an MFA in Ceramics at the Cranbrook Academy of Art in Bloomfield Hills, Michigan (2013). She currently lives and works in Los Angeles. 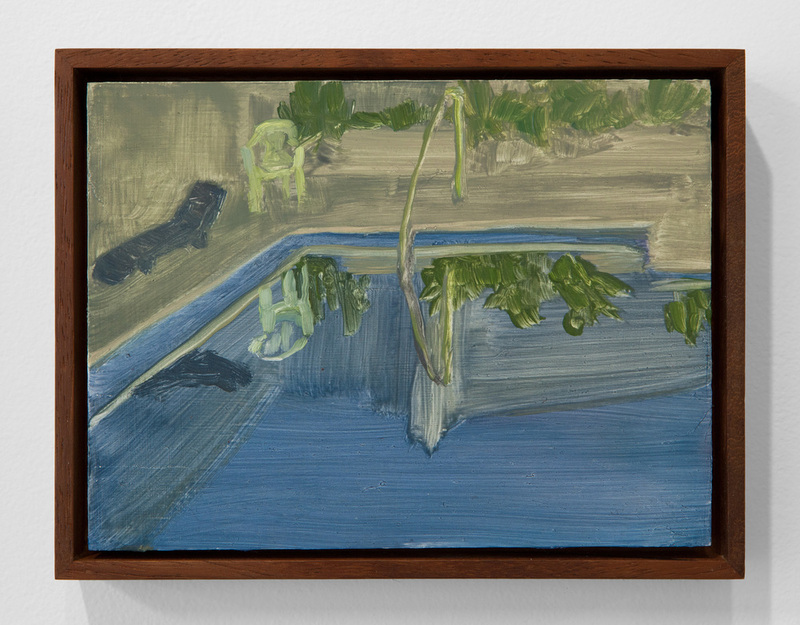 Erica Mahinay, Surfacing, 2015, Oil on canvas and treated fabrics, 47"x36"
Test Site, 2015, Oil on canvas and treated fabrics, 94"x72"
Erica Mahinay, Pools (night/July 2012), Oil on Panel, Ash Frame, 6"x6"
Erica Mahinay, Pools, (night/July 2012), Oil on Panel, Ash Frame, 10"x12"
Erica Mahinay, Pool (night/July 2013) Oil on panel, Iroko Frame, 10" x 12 3/4"
Erica Mahinay, Pooli (evening/July 2013), Oil on Panel, Iroko Frame, 10" x 12 3/4"
Kathryn O'Halloran, Infinite Solitude, 2015, plaster, mirror, towel cushion, stoneware, 69" x 40" x 55"